5 voyageurs consultent actuellement cet établissement. Vous souhaitez poser une question à l'établissement The State Resort ? Niché en plein Wat Phrik, le The State Resort est idéal pour partir à la découverte de Phitsanulok. La position stratégique de l'hôtel, à seulement 15.3 km du centre-ville, permet aux clients de rejoindre facilement et rapidement de nombreux sites touristiques. Grâce à son excellente situation, l'établissement permet de se rendre facilement sur les sites incontournables de la ville. Les équipements et les services proposés par le The State Resort sont la garantie pour les hôtes d'un séjour agréable. Les clients de cet établissement peuvent profiter d'équipements tels que service en chambre 24h/24, WiFi dans les espaces communs, parking, service en chambre, navette aéroport. Profitez d'équipements de qualité supérieure durant votre séjour. Certaines chambres sont équipées de télévision écran plat, miroir, chaussons, serviettes de toilette, accès internet (sans fil), qui permettent aux hôtes de se détendre et de recharger leurs batteries après une journée bien remplie. L'hôtel dispose de superbes équipements de loisirs : pêche, jardin, pour n'en citer que quelques-uns, rendront votre séjour inoubliable. Services hors pair et adresse prestigieuse sont le lot du The State Resort. 1. Location is just what I needed, as it's near the airport & on the way to my activities in Phichit on the next day, and I rented a car from the airport. May be inconvenient to reach for anyone without a car. 2. Overall cleanliness is ok, but a part of my room's floor was wet by some water condensing from the refrigerator. 3. The facilities were basic. No hair-dryer and hangers in the room (only some hooks on the wall), but you can call the reception to bring them with no charge. 4. No buffet but quite a few choices for breakfast. Just what I needed. 5. Convenience stores are kilometres away. But there are a few near the airport. Good food, good location and wonderful room. It was really pleasant to visit. Will stay again. I stayed here many times during 90% of my trips to Phitsanulok and nearby provinces. I chose it because its location which is near the Phitsanukok airport, and easy to drive to Pichit. A lot of restaurants nearby, including the good one next to the hotel which has the same owner. Convenience stores and shops, such as Tesco Talad and food market (Talad Baan Mai) are about 7 km on the same road from the hotel. Hotel rooms and environment are clean, peaceful, and nice. Staffs are friendly and service-minded. This hotel offers one of the best values for money as well. I chose this hotel because of its location, that I wanted to stay near Phitsanulok Airport and also have easy access on the road to Phijit province. It met my both criteria on location. I stayed here for 1 night. The owner who is very friendly and service-minded also works at the reception. My room was comfortable and clean, with all basic amenities. The hair-dryer was not in the room, though, but available for free borrowing at the reception. I didn't have breakfast, as I needed to check-out before serving time (7-10am), so I just can't comment on that. The room price is very reasonable, good value to money. Overall, it was a comforable stay. Everything is good here with reasonable price. Breakfast is good too. Everything met my purposes of the stay (e.g. location near the airport, easy to drive down to Pichit Province, easy to find restaurants and a convenient store nearby. However, I found the following items are lacking in the room, and had the hotel provided them, my stay would be more perfect: 1. There are no tissues (both toilet tissues and face tissues) in the room. I believe that the hotel can provide some upon request, but is it basic item to put in the hotel room without any asking? 2. No hair dryer in the room. I believe it can be obtained upon request. 3. Breakfast time starts at 7:30am which I wish it could have started earlier say 6:30 or 7:00am. Since I had to leave the hotel early morning at 7:00 am so I didn't have the chance to eat hotel's breakfast even it is included in my room rate. If you don't like busy city, just try this place outside the ring road, surrounded by rice field. The staffs are friendly and helpful. One inconvenience I can mention is the room light, no bed light for reading. It was nice to stay at The State resort,this resort is not in downtown, suit for the traveler who has the car. Iit suit for stay and drop at Pitsanuloke before traveling to upper north. This resort is value for your money with quite & nice atmosphere, garden & view lake. The resort is also clean . You can relax & touch the nature surrounding with rice field around the resort. Overall is OK and I really enjoy to stay here. The hotel is very great for the price, room is cute and clean, breakfast is a bit on short of selection, the downside is hotel located out of town and you must have a car to commute. We were going to Chiangmai and would like to take a break along this journey. This place is pretty value to our money actually and the staff is nice and helpful. We love the decoration of this resort (not in the room) but overall picture which starts from public restaurant in front (there is a good coffee and international foods brought to you by the same owner) and the breakfast area closed to the natural pool on the back. However, we found that it is not easy to get this place in the night time. Be sure you are supposed to get this place before the sunset. Quiet. TV with USB for my movies on external drive. Comfortable bed. In general, our stay was pleasant. 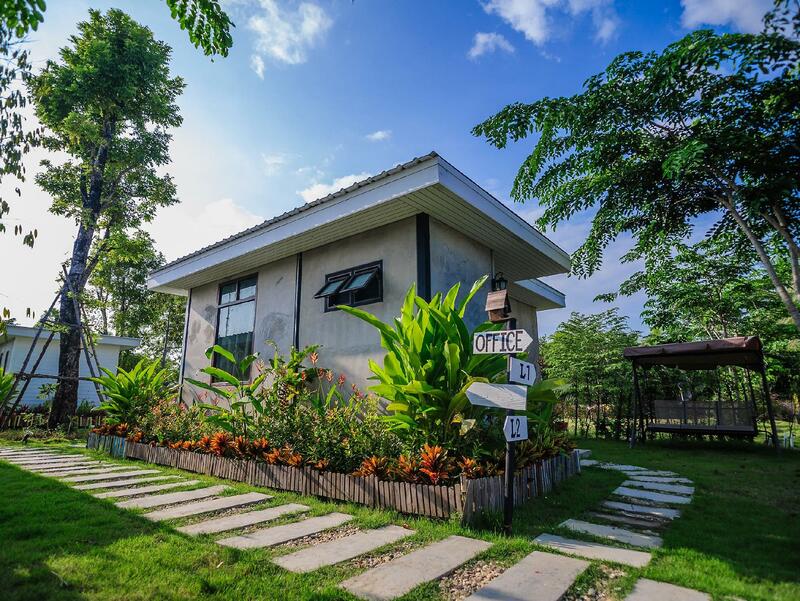 We (with my wife and 2-yr-old daughter) needed a comfortable break in a drive from Chiang Mai to Buriram and after being satisfied with a previous stay here for the same purpose, we booked again. I must say, I was not happy with the soap/shampoo containers in the bathroom. While trying to find some writing that differentiate the containers between shampoo and body soap I dropped the brittle plastic container which promptly broke on the tile floor and deposited the contents in the process. Cleaned it up with the foot towel and toilet water gun, then reported this incident to the breakfast waiter. We were charged what I thought was an excessive amount for such a product but that's OK given my clumsiness. I suggest getting unbreakable plastic containers in such an environment - clearly labelled with content. Breakfast was not worth eating - including the coffee. Our overnight stay was fine but in the rain I thought that with a small child the close proximity to a lake was a little risky on slippery steps outside the room. A wider platform would have made it a lot safer and thus more comforatble. There is only one restaurant near the hotel - at the entrance to the hotel and probably the same company. This was reasonable. I felt like I stayed in the container. It was such a small box room but nice idea though. The shower in my room was broken so water spread everywhere. Breakfast was delicious.